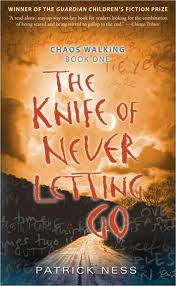 The Knife of Never Letting Go has received rave reviews from around the blogosphere. It's also a dystopian series which increased my interest. Can't get enough of humanity's cruelty to humanity! But most importantly, all these bloggers I love, love this series and chatter about it and because I enjoy having shared literature upon which to discuss life's ideas and themes, and because I wanted to love something like I'd loved Mockingjay, I read it. The Knife of Never Letting Go is a fast paced, interesting universe that takes place on some other planet and has a very unusual dilemma. Everyone can hear each other's thoughts, see each other's memories and feelings, in something they call noise. And when I say everyone, I mean all the men of Prentisstown. There are no women, the same disease that enabled animals to talk and men's noise to be visible to one another has killed all the women. Or this is the story our protagonist Todd Hewitt believes, it's the story he's always been told. Todd is the last boy in the town, the last one to become a man. His birthday approaches in a month and he will go from boy to man. So Todd is out in the swamp of Prentisstown with his dog Manchee when he discovers something odd..silence. It so confuses him that he is unable to fully hide it from his noise as he makes his way through town and drama ensues. Todd is about to discover that everything he believed to be true is not necessarily the way things are. Like others, I found myself sucked into this story. I think Amanda of The Zen Leaf said it best when she said it's essentially one long chase scene. For that reason, it's quite easy to keep turning the pages, hoping Todd and his companions will make it to safety. Also the true back story is kept from us for quite some time so the mystery of that, revealed enough in bits and pieces through the new things Todd discovers, is another reason to eagerly turn the pages. From a pacing perspective, the book starts out a bit slow but picks up. The voice of Todd is clearly defined and immediate and his growth and discovery is an experience for the reader. His changing feelings towards Manchee and his companion, Viola, are well developed and believable. I did have issues with the believability of aspects of the plot that kept this from being a perfect read for me. For example, certain people Todd will somehow beat within an inch of their lives and they seem to come back stronger and faster. In that regard it felt like an action movie that just won't end. I'm also not sure I completely believe that the back story of Prentisstown would happen. Maybe this makes me naive but it stretched believability for me, and seemed much more about making a certain social statement than creating a plot that was fully believable within its world. I haven't really seen anyone else complain about this, so it's likely just me. "It's like the song of a family where everything's always all right, it's a song of belonging that makes you belong just by hearing it, it's a song that will always take care of you and never leave you. If you have a heart, it breaks, if you have a heart that's broken, it fixes. In this space, the noise is drowned out by the noise of these creatures singing to one another and while there may be some other metaphorical meaning to this, to me it communicated how much peace there is in surrender to living in the present. The knife is obviously the biggest metaphor of the book, this one weapon Todd has and uses for protection and also to slay. It becomes almost a part of him and he uses it according to his evolving and growing self. Another thing to note is that for some reason, Ness has chosen to alter the spelling of certain words Todd says. I believe this is intended to communicate in a way, the lack of "proper" education Todd has (he can't read for example) but it's slightly distracting to the reading experience. The reason for this is that when we read, our eyes scan a page and intake only some of the letters and our brain makes reasonable predictions about what the text says based on meaning. So when there are misspellings or when things are written in dialect, it can sometimes cause you to need to reread something or to misread something. I had this happen once or twice in The Knife of Never Letting Go. So yes despite some issues with the believability of the plot, I find this to be a very worthwhile read and one that can certainly open up all kinds of discussion about men and women, the treatment and understanding of women in society, the nature of violence, and the problem of too much information. I'm looking forward to reading The Ask and the Answer which I put off until I felt I could write this revew. I also preordered Monsters of Men so I should be all caught up soon. Things You Might Want to Know: There IS a fundamentalist cult religion and I know this is tiresome storyline for some. I'm not sure that a flip side of religion is shown, but I could just be forgetting. I think there was also minimal profanity. Source of Book: Bought it!